If the leaves on your confederate jasmine are browning and falling off, that may be a sign your plant stressed. This is a guide about confederate jasmine leaves turning brown and falling off. My confederate jasmine has turned brown in the Atlanta ice storm. Is it dead, or will it releaf? It's 5 years old and well established. Leave it in place, water as normal, and wait until Easter or so. If there is no sign of green by Easter, clip off part of one branch and look at the cut ends. If there is green inside, you might still save it; if it's all brown and dry and hard, it may very well be gone beyond help. Good luck! I have Confederate Jasmine on my fence. It has brown spots on it and the leaves are turning brown and falling off. Can you help? I can't be certain without seeing it, but the symptoms you're describing sound like flower blight, a fungal disease that commonly afflicts jasmine after spells of warm, moist weather. Symptoms include flowers with dark spots that rapidly join to form blotches and eventually turn brown and collapse. The spores of this fungus over-winter in the soil. Good sanitation practices and providing the proper growing requirements will go along way to help control this disease. Pick off infected flowers to keep the fungus from forming spores and remove any fallen plant debris. Mulch around the base of plants to prevent soil-laden spores from spreading when water splashes onto plants. 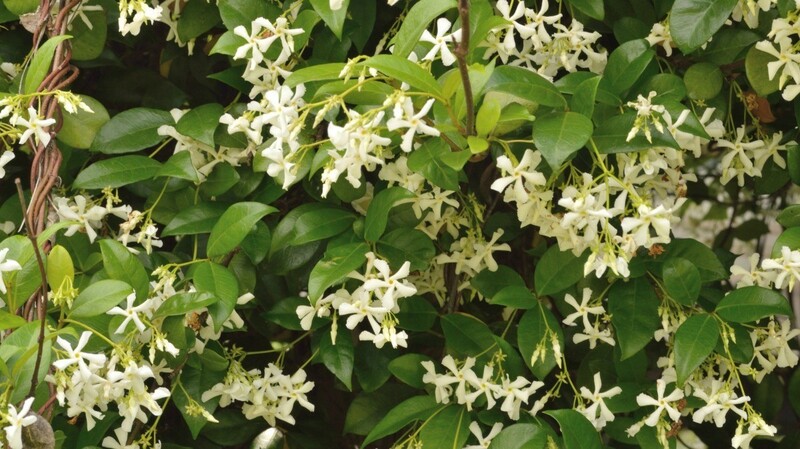 Make sure jasmine plants have adequate air circulation and avoid planting them in low-lying areas. Southern blight is another kind of fungal disease that afflicts Jasmine. This is more often seen in young plants with bark that has not yet fully developed. The plant suddenly wilts and dies and for this type of blight, there is no cure. One of ours was cut back too closely and we lost it all. Another of ours was too near to the driveway and received an unhealthy dose of Radiator fluids, but after the browning, it actually came back! It grows quite large, so trying to keep it too small can be disagreeable to it. Don't spray it for pests. Mine has never had a one in over fifteen years. Don't plant near a pool, the Chlorine kills it. Don't over or under water it. It's fairly independent and likes moderate water in moderately rich soil. Be certain to give it something strong to climb on! Don't over fertilize it. I never put anything at all on mine. Good luck, and hope this helps you to figure it out. It's a great plant, requiring little care and pruning, but it takes up a LOT of room, so beware but enjoy the blooms. I have jasmine planted in containers on top of my pergola and they are turning brown. What could be issue and will it grow fast in containers? Leaves can turn brown if they get too cold. They like it warm...so that is good. I can't have them in my neck of the woods now as our weather is too cold and too rainy. Over watering is one cause of browning leaves. These are super sensitive plants. It seems like any change in their "routine" gets them "stressed". Just like most humans, I guess. There is a nice article about them and their care on one of my favorite garden go to sites. Let me make sure that I understand what you are saying; You have your Jasmine plants planted in containers and placed on top of your pergola? How large are your containers and how long have you had them planted and placed on the top? Do your containers have good drainage? Jasmine will get root rot if soil stays wet over a long period of time (and leaves will turn brown and fall off). As a general rule most people would plant the Jasmine in the ground (maybe at the four corners) and let it grow up the posts and eventually cover the top. Jasmine is very easy to grow with the exceptions that it gets water on a regular basis but does not "stand" in water for long periods. 90 degrees is pretty hot if your plants are in the heat all day but it seems they may still grow if tended well. I have always found that Jasmine grows best when planted in the ground but I do see it growing in containers but I do not believe it will grow any faster in a container. I guess you are trying to get a good cover on your pergola as fast as possible but I'm not real sure this will work as it seems it will be a big problem to water (or even check the soil) when the container is 6 to 10 feet in the air. I have two confederate jasmine plants (separate locations), the leaves are turning red/yellow/brown and then falling off. The plants are eight to ten years old. The ground is not wet. What can I put on these plants to help them?